The ozone exceedances occurred June 13 at the Scott County Park monitor (north of Davenport), and June 19 at Jefferson Elementary School, Davenport, Scott County Park and Rainbow Park in Clinton. 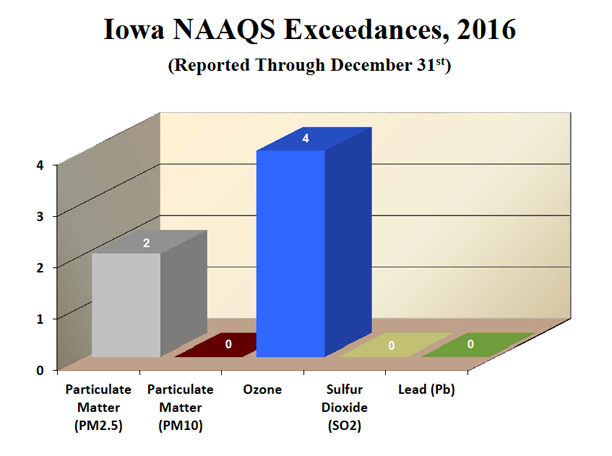 The PM 2.5 exceedances occurred May 7 at air monitors in Des Moines and Cedar Rapids. After enforcement actions by the IDNR and Iowa Attorney General against Grain Processing Corp. of Muscatine, the company agreed in 2014 to upgrade its facilities to reduce both sulfur dioxide (SO2) and PM 2.5 emissions. In July 2015, thecompany switched from coal to natural gas to fire its boilers, further reducing SO2 emissions. CLICK HERE to download the full exceedance report from the IDNR.